Despite being born and raised in Football Hall of Fame city, a super destination for every football fan, I’m no Adam Schefter. But after 30 years of marketing consulting for clients, I understand the design and culture of championship team performance. The NFL’s top two teams will soon battle for greatness on one of the world’s biggest stages; the Big Game will be broadcast to over 100MM viewers on a night when a 30-second televised ad costs more than $5MM dollars. How did the Patriots and Rams qualify for such an occasion? And how can business leaders apply similar tactics to rise to excellence in their own arenas? Three lessons follow. In Culture Code, The Secrets of Highly Successful Groups, best-selling author Daniel Coyle shares that achieving effective team performance starts with intention. He challenges us to be “painstaking in the hiring process”. 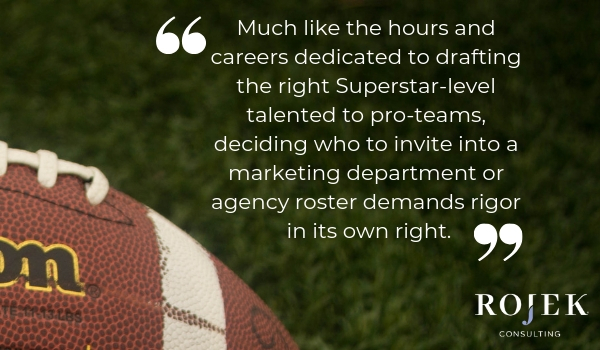 Much like the hours and careers dedicated to drafting the right Superstar-level talented to pro-teams, deciding who to invite onto a marketing team or an advertising agency roster demands rigor in its own right. Appointment of specific team players is the first and foundational “belonging clue” that manifests a team culture of safety, inter-dependency and motivation among its members. Coyne categorizes skill recruitment into two basic types: skills of proficiency and skills of creativity. Skills of proficiency apply to executional excellence, operational scale and efficiency. Skills of creativity apply to the task of innovating towards something better that did not exist before. In the wake of an infamous 0-16 season, the Cleveland Brown’s new general manager John Dorsey was under immense pressure to add talent to the team’s roster in the 2018 draft; yet general opinion was mixed on how the team should use their #1 overall pick. Dorsey surprised most NFL analysts with the selection of QB Baker Mayfield (many thought the safer bet was Sam Darnold). With Baker at the team’s helm, Cleveland-area fans felt a momentous cultural shift take place. His skills of proficiency (his accurate, powerful arm) and skills of creativity (a masterful use of timing when running plays) combined to achieve a 7-7 record in games he played. Many on the north coast wait with excited anticipation to see how the team’s shift toward a winning culture will play out next season. Consider how you design your team to include a mix of both proficient and creative skills sets – with a common view of purpose and mission – in the year ahead. Watching champion football teams execute on the field is exhilarating. Success or failure is realized at every down. This intense three-hour battle of the best is of course preceded by team training. Beyond recruiting top talent, collaboration sets the stage for the end of season outcome. The Patriot’s come to the table with the best NFL QB of all time – yet Brady has never been the highest paid QB in the league. The sacrifice of his potential earnings sets an example for other players and works to keep his team competitive. Why do millions of viewers tune in to see this game? It’s about more than the league’s best technical players being put to the test. It is the battle of two finely-tuned teams that will capture the attention of a nation. Today, the CMO’s goal is to quarterback across functions well enough to deliver an end-to-end customer experience, the true north star for growing brands and companies. C-suite Leaders can model better teaming practices across their companies by demonstrating how each function can play an important part in delivering outstanding customer experience, the kind that engenders long term brand loyalty. The good news is that insights from big data can support this conversation and inform the customer experience playbook; it needs to be curated and shared in a way that achieves understanding and alignment across its many stakeholders. 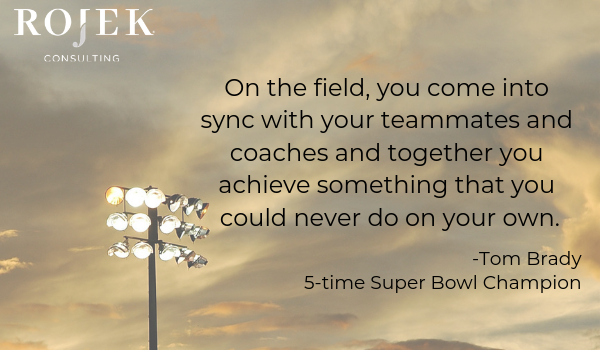 Super Bowl caliber talent exists within the advertising industry. Agency partners should be better integrated into client teams to serve as the transformational cohort many companies need. Together they achieve the cadence of collaboration to create superior brand experiences and advance modern customer-centricity. Do you know one of the top priorities for CMOs in 2019? Building an ecosystem of the right partner agencies. According to a 2018 study sponsored by Accenture and conducted by Forrester, 24% of CMO respondents at the director level and above cite building networks of agency resources as a top priority in the coming year. An experienced, certified advertising agency search consultant is the industry equivalent talent scout for the hiring organization, assessing agency supplier choices; we do this with intention and rigor, and an eye towards what Mr. Coyle advises we consider “potential fit, contribution and performance”. Contact us to get started! With intentional team building, there’s the fun of Sweet Victory to come!